I *love* Paper Piecing, because I'm able to use up all those odd sized scraps of Designer Paper I have laying around. The Rubber Cafe came out with some new Halloween images this week, that just begged to be paper pieced. Can't you just see using up all your scraps to Paper Piece the kids costumes in this new Trick or Treat set. 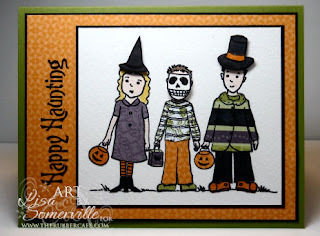 I used the Cast-a-Spell DSP from Stampin' Up! to Paper Piece the kids outfits. The only parts of the images I colored where the skin and hair. The card did take a bit of time due to all the cutting, but the end result was so worth it. Very cute, excellent piecing, such small little pieces, you must have excellent vision! Fun card.